With all of the comforts and cozy layers of Fall comes the return of the beloved blanket scarves. As the temperatures drop, I start pulling them from my closet bins where they've been safely stored away, and ready them for multiple outfit pairings ranging from sweater-and-pant combos to sweater dress-and-boot combos. They're the perfect layer to not only add warmth during the chilly and breezy Fall and Winter months, but to also add dimension, texture and, of course, beautiful color to your outfit. I already have quite the collection of them -- almost comical given the sunny, hot and arid weather that's typical of Los Angeles. A little impractical? Maybe. But what can I say? I love a good blanket scarf! I have this one, this one, this one, and this one, just to name a few. So, if you're somewhere on the spectrum of novice blanket scarf collector to borderline hoarder (hehe) then this post is just for you! 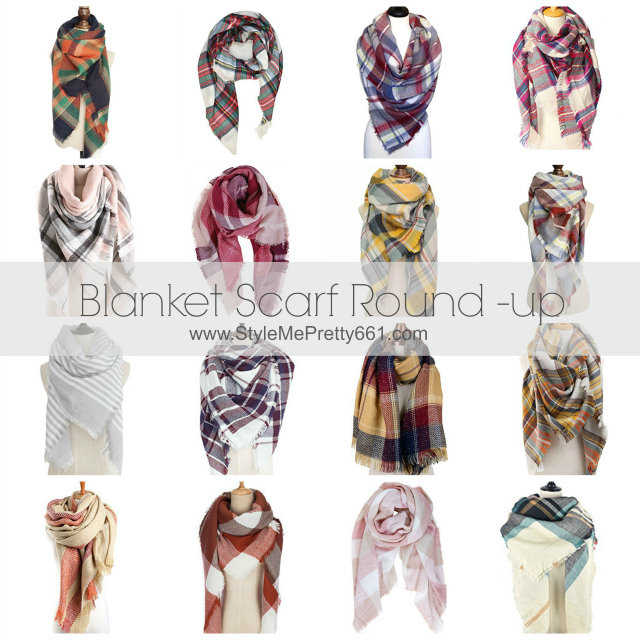 I've scoured the Internet and rounded up a huge collection of the prettiest blanket scarves in a rainbow of colors and at the BEST prices! From pastel and neutral tones to the rich, seasonal tones -- there'll all here for you. And most are in the ballpark of $15 or less! Scroll through the photos below and click on the ones you love! So many pretty options, right? I'm especially loving this one, this one, and this one. This one in the classic tartan plaid is also a must-have. Thanks so much for stopping by! Enjoy the rest of your Sunday!